Working for Worcester (W4W) is a citywide day of student-lead community activism aimed at making infrastructural improvements to Worcester’s community spaces. The project is a partnership of student organizations, local businesses, academic institutions, city government, and community groups. Last year, the project day saw over 1,200 volunteers from 10 Worcester universities and multiple corporations/neighborhood organizations headed out across the city to make over $150,000 of construction and renovation improvements at 23 sites! By the end of the day, new playgrounds, school yard basketball courts, community gardens, and S.T.E.A.M. Rooms were created from scratch and Community Spaces were refurbished, youth centers renovated, parks cleaned up, and dozens more renovations were implemented! It was an incredible day and an incredible symbol of why Worcester is such a special community! 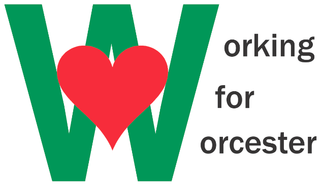 W4W seeks projects that maximize impact, and its projects vary greatly in their labor and capital intensity. Last year, W4W completed projects ranging from labor intensive park cleanups to comprehensive playground and basketball court builds. W4W’s student-entrepreneurial focus and emphasis on student/site collaborative design, preparation, and implementation allow our resources to be allocated most efficiently. Through creative partnership with our sites, the project mobilized untapped resources towards things ranging from a $12k playground build at Rice Square School to cost-free labor intensive clean up sites. Click here to view W4W's project results. W4W is evaluating and selecting project sites on a Requests for Proposal (RFP) basis. The RFP process will allow the W4W management team and advisory board to better select project sites based on the variety of factors expanded upon in the following pages. As mentioned above, W4W seeks to conduct projects at sites that require varying degrees of manpower and capital. In the past Five years, W4W awarded Ten grants of $10k, seventeen grants of $5K, twenty grants from $2.5-$3k, and fifteen grants of $1k or less to its sites. Given W4W’s desire to once again facilitate infrastructural improvements at multiple sites throughout the city, this year we will accept proposals for projects as high as an estimated cost of $15k; however, the bulk of our awarded grants will be for projects in the $2k-7k range. We also strongly encourage submitting for any labor-intensive volunteerism projects like clean-ups, painting, and landscaping. In addition to having a clear and feasible idea, site representatives/contacts should also take into account the execution, implementation, and maintenance of their projects. While at this early phase of the project development process, site representatives/contacts do not need to gather formal price quotes for every element of their proposed projects, the W4W team does require a well thought out, estimated range of the project’s total cost, timing, and labor demands. Many of these details will be worked out through the student/site collaborative planning process; however, we need educated estimates at this stage. The application will be available beginning on September 8th, 2017 via the link at the very bottom of this page. The W4W staff will then compile and review all RFPs, and selected sites will be visited by a member of the W4W team. We encourage you to attach any photographs, designs, and/or other relevant documents in the attachments section of the online form. Please be aware of the RFP deadlines and timeline detailed below.